A disruption in the force: Users win from Forrester’s Playbook, but will AR? If the new TechHeads survey of CIOs is correct, Forrester’s new ‘Playbook’ research framework is set for success. When July’s TechHeads survey asked 250 CIOs about how they want to consume analysis, the answers was clear: in short, free-standing chunks. Forrester’s Playbook is a great step in this direction, dividing each the challenges facing industry professionals into a consistent framework used across every Playbook. The result produces great challenges and opportunities for analyst relations professionals. TechHeads is an annual study conducted by Rocket Communications which asks top UK technology directors and CIOs how they consume information (See http://rocketcomms.net/tech-heads.php ). My colleagues at Loudhouse Research crunch the data, and it’s amazing to see how these managers are crying out for concise headlines and short, self-contained blocks of text. That means producing strongly-structured analysis, where each component is free-standing and, potentially, the blocks could be ‘sliced and diced’. 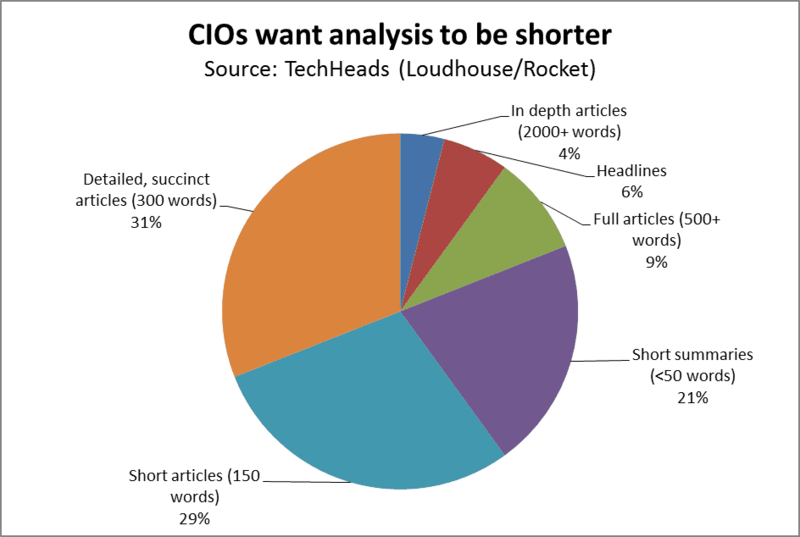 In the TechHeads research, for example, CIOs are looking for just 4% of analysis to be over 2,000 words. Other firms have already moved in this direction: for example research from Current Analysis and The 451 Group has shone brightly, for several years, for its concision. As far as I know, Forrester is not setting itself word counts like that, but the modular Playbook approach is the most substantial step towards this modularisation by a major analyst firm. 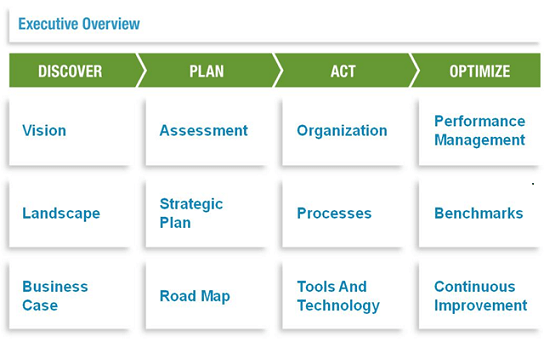 In the Playbook format, each of four key priority areas for professionals are broken down in to three strategic tasks. This framework for tight writing gives analysts a question to answer, allowing the analysis to be focussed and pointed. That helps the reader. It also accelerates the development of high-quality writing by analysts, a challenging process on which Forrester sets great value. Of course Forrester emphasises that the Playbook is more than just a way to organise its research. It is a framework for how to engage with clients via research, consulting, peer-networking (Leadership Boards) and events. Analyst relations professionals, however, should not imagine that this makes their jobs easier. Forrester presented the Playbook last week to the recent London meeting of the IIAR, a key stakeholder group. One of the other attendees there, Kim Crosby, told me that when Forrester announces changes, from “roles to playbooks, it’s just complicating simple things that don’t require intellectualising”. That’s not a Luddite view: it’s a well-observed point. Changing the structure of research produces a disruptive learning curve for readers, writers and influencers. That might initially lessen the force and impact of some Forrester analysis. Forrester feels that the net result will be worth ‘the disruption in the force’, and the TechHeads research makes me think they are right. Like it or not, analyst relations managers must adapt to the Playbook format. I gave similar guidance a few years ago after Forrester moved to role-based research (http://www.influencerrelations.com/997). AR managers’ internal clients generally would prefer research that’s not like the Playbook: they want research that focusses on one vendor’s solution and explains where it can be used to unlock the most client value. The bad news is that if Forrester holds its course, less and less research will be like that. But the good news, if UK CIOs are indicative of Forrester’s global audience, is that the Forrester’s Playbooks will be more useful and more influential than its current research. That produces an opportunity for AR managers. If we are able to present solutions in ways that corresponds as closely as possible to the Playbook structure, then Forrester analysts will find it easier to write about our firms than about competitors. Of course that requires extra work to reconfigure information: we need to hope that our competitors won’t be bothered to take the effort, or to reap the rewards.